The Premium HMI 5 software platform is a powerful programming environment for the creation and development of graphical user interfaces and includes the ‘Premium HMI’ development tool and different Win CE and Win 32 runtime versions. Premium HMI 5 is also a platform with open architecture that allows integration of third-party software components. Cross platform is the strong point of the system, as it allows the use of the same project with Win CE and Win 32 runtime, without any modification in the development tools. For the Win CE operating system, two runtime versions, Basic and Advanced, are provided, while for Win 32 operating systems there are three versions: BASIC, ADVANCED and PRO. BASIC versions include all the features necessary for the development of an HMI project with a limited number of variables. The PRO versions are suitable for the development of more complex projects, where historicization of production data and alarms on local or remote databases is required. The ADVANCED versions add a Web server function that makes the HMI project remotely accessible and allows to send SMS or e-mails in case of alarm. 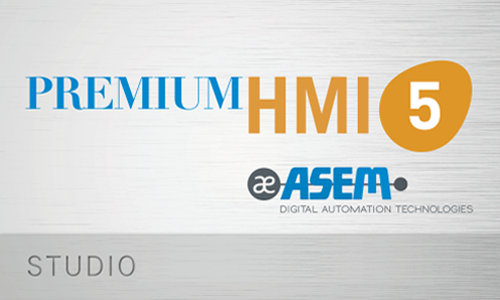 The full control of the hardware technology, communication and software platforms has enabled ASEM to develop and propose high-end, but easy to use, HMI solutions, with features and performance to satisfy all the demands of the new HMI era.